Ying Chang Compestine grew up in Communist China and now lives in Lafayette, California. She is a popular author of children’s books, cookbooks, and novels. "The somewhat whimsical illustrations of the distinctive individuals, palace, interiors, and clothes are made in watercolor, pen and ink and highlight Roberts’ feel for fashion, design and color." 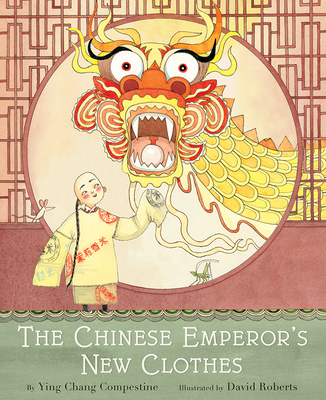 "Roberts (The Prince and the Porker) has marvelous fun with the details of the Chinese court, rendering the robes, hats, and architectural flourishes of the palace with wit and style. The hero of the original tale was a child, too—but in this version he’s the author of the plan and the focus of the action, and the story is the better for it." "It describes how this particular telling of Hans Christian Andersen's classic tale emerged from the oppressive, literature-scarce world of the Chinese Cultural Revolution. Roberts' watercolor, pen, and ink illustrations . . . add humor and nuance. . . A clever retell ing buttressed by a fascinating back story and vivid art." "[Roberts] often incorporates Chinese latticework screens to frame the action and uses Chinese textile motifs, headdresses, and hair styles to ground the drawings in the culture. A mouse and a cricket make frequent appearances to delight observant readers and listeners."